Fair point. It’s hard enough to talk about the present of marketing, seeing as how much of the industry is rethinking its approach to everything from media channel strategy to metrics to the kind of talent that marketing organizations need. Charting the future under these conditions is like mapping the trail up a mountain in the midst of an avalanche. And yet, that’s what I, and the students, had signed up for. As the instructor, I came to each class with the terrifying knowledge that I might have some information, but I didn’t know the answers. The best I could hope for was to help us ask the right questions. Sorry, crystal ball not included. When people talk about the future of digital technology, the conversations often revolve around specific predictions: how many zetabytes of data will be created over the next few years, how much infrastructure will move to the cloud, how wearable devices like Google Glass will change our relationship between the digital and physical world? Those are interesting questions with profound implications for businesses of all kinds, including marketers. They are the kind of thing you could reasonably expect to see addressed in a class called “The Future of Marketing” – and address them we did. However the goal of the class was not only to study the tech trends, but give the students – many of whom are mid-career professionals looking to add skills to help them get ahead in marketing and media – a framework for figuring out how they might play out in different kinds of organizations under different sets of business conditions. Four visions of the future. To do that, we employed a method called scenario planning, used by many companies and institutions to develop strategies for an uncertain world. After a crash course in the basic technique, the class broke up into four teams, each owning a different version of 2020. Our scenarios divided along the lines of economics (growing economy vs. stagnant or shrinking) and openness of information (relatively free access, vs. restricted or controlled). We then tested how various marketing innovations would look under each of these different sets of assumptions. Different flavors of prosperity. The open, prosperous world, which the students named Cosmic Free-for-All, featured lots of rapid innovation as you might expect, with upstart businesses competing to attract hyper connected consumers and everyone scrambling to educate themselves for new opportunities. Brands have given up trying to control the conversation and outsource to a vast network of specialists, entrepreneurs and freelancers. In The Great Firewall, a few huge media oligopolies tightly control access, intellectual property and conversations. Though the economy is doing well, innovation is slow and big megabrands slug it out through slickly managed, highly produced campaigns. 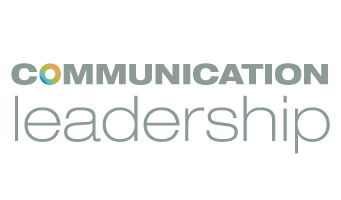 Marketing professionals in this world need to be highly skilled, data-literate storytellers, comfortable working in large organizations. Planning for the worst case. The economic and political atmosphere can shift dramatically in a flash, as we’ve seen in the past 15 years, but business and marketing continue even against headwinds. The scenarios that students developed for the down economies are both challenging and insightful precisely because they address the situations that brands don’t want to think about. 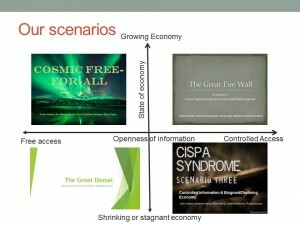 In The CISPA Syndrome (low prosperity, controlled information), rising terrorist violence has triggered rigid government control over networks and data as well as global isolationism and economic recession. Market access is limited; regulatory overhead and access restrictions make it hard for companies to apply digital and data innovations in a consumer-facing context. Consumers have their heads down and are not receptive to radically new approaches to storytelling, content or brand experiences. In this world, consumer staples are king, customer retention is the name of the game and the impact of new technologies is tightly constrained. Stuck in low gear. For my money, the most interesting and problematic scenario was the one students named The Great Dismal, because it somewhat resembles the world described in the works of writer William Gibson. This is a world with free-flowing information but a stagnant economy, where today’s highly-touted free content/free service business models limp on, draining real money out of the creative ecosystem without generating anything to make up for the loss. In The Great Dismal, the digital treadmill drives everyone – brands and individuals – to work harder for less in the hopes of gaining “exposure” or “buzz” or something that will give them escape velocity that is limited, in reality, to a very few. Marketing in this environment is a cutthroat zero sum game, with hard lines separating the elite luxury market from the listless mass of downwardly mobile consumers and marketing organizations squeezing every dollar for ROI. Which future? Although you can trace a logical path from 2014 to each scenario the students developed, is unlikely that the real future will precisely resemble any one of them. That’s fine: the goal of scenario planning is not to predict, but to expose unexpected implications and broaden our expectations so that we are not caught off guard, come what may. How well did it work? I guess you can insert your favorite “future is uncertain” cliché here, but from my point of view, we gathered some genuine insights and real-world marketing organizations could do worse than walk through this process on their own.